This beautiful village house is a rarity thanks to a location that offers the best of town and country. Owners Richard and Shelley Lowes snapped it up after a search to find a rural home within walking distance of a town. “Our previous property was on a moor and a car drive away from any amenities. Here we are a 20-minute stroll from Ripon,” says Richard. The Lowes bought the house in June 2010 from a couple who had run an architect practice from the top floor of the property. The previous owners used their design skills to add a garden room, which is off-set on an angle to catch the maximum natural light. Richard and Shelley have since put their own mark on the Victorian house, which was built in 1864. They installed a new kitchen, changed all the bathrooms and turned the top floor office into two en-suite bedrooms using local companies Ripon Interiors and Alpha Kitchens and Bedrooms. They also replaced the conservatory roof and completely redecorated. The granary, which was separate accommodation, is now a gym and outside, they put in a bonded drive, a children’s play area and a vegetable garden. “It was a big project. We had the painters and decorators here for six months,” says Richard. The seven-bedroom property has four reception rooms, a breakfast kitchen with conservatory, a main bedroom with en-suite, six further bedrooms, three of which have en-suites, and a house bathroom. 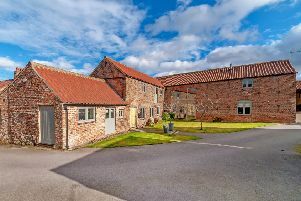 There is also a granary annexe used as gym but which could be converted back into self-contained living space, a double garage and outbuildings plus a two-bedroom cottage. The house sits in three acres. The Lowes are selling to spend more time at their home on Portugal’s Silver Coast. *Sharow is a popular rural village on the outskirts of Ripon. It is a mile from the centre of the cathedralcity. It has a pub, primary school and cricket club. The A1M is just three miles away and Thirsk train station is 10 miles away and has a direct service to London.